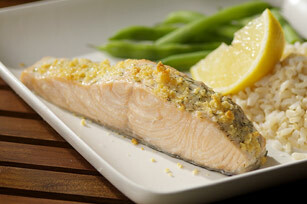 Here's another great way to enjoy salmon fillets. Get some dill weed, Parmesan and mayonnaise and let's get started. Place fish on foil-covered baking sheet sprayed with cooking spray. Broil, 4 inches from heat, 4 min. Meanwhile, mix mayo and dill weed until blended. Remove fish from broiler. Spread with mayo mixture; sprinkle with cheese. Broil 2 to 4 min. or until topping is golden brown and fish flakes easily with fork. Serve with lemon wedges. Serve with hot cooked brown rice and steamed green beans.